Heat a small pan add1/2 tsp of oil ,add channa dal,coriander seeds,red chillies and fengreek seeds roast till it slight golden color .Grind it to a coarsely powder. Pressure cook dal for 3 whistles,mash and keep aside. Chop the onions,vegetables ,tomatoes,green chillies. 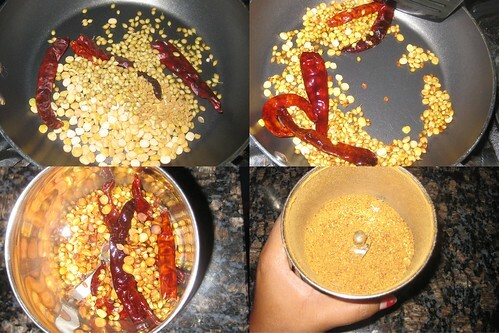 Heat pan oil and add mustard seeds,cumin seeds when its pops up.then add green chillies, hing,curry leaves.fry for 1 minutes. 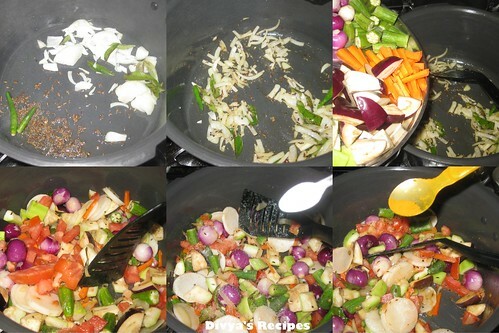 Add sliced onions,small onions fry for 4 minutes,then add tomatoes and vegetables fry in medium flame for 2 minutes.Add little salt while frying for easy cooking of the vegetables. 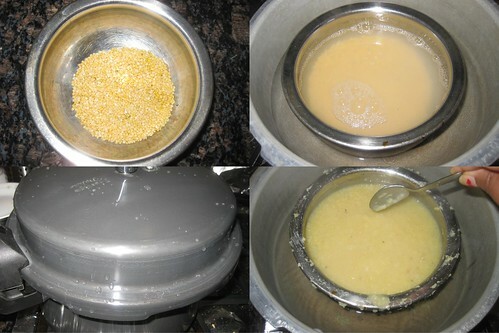 Add required water and the tamarind and boil till the vegetables get cooked.Add coriander leaves,salt and jaggery.Add the sambar powder and bring to boil. Add the cooked dal and mix well.Adjust water as needed to get a sambar consistency.Bring to boil and garnish with coriander leaves. Serve with idly / dosa or rice. 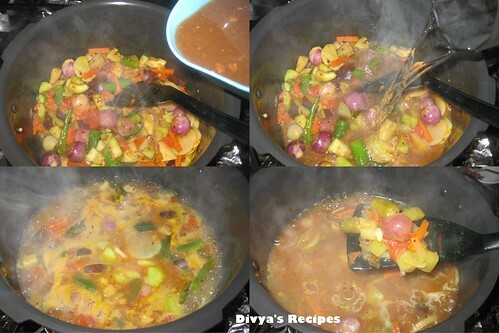 Delicious & tempting sambar. Lovely clicks. 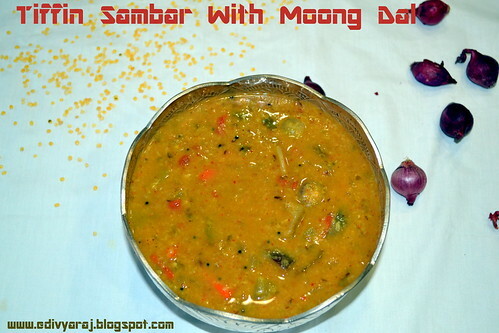 Delicious sambar with moong dal. 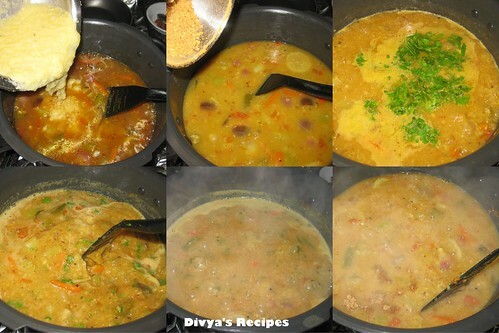 Healthy and delicious sambar, I do it just with onions and tomatoes..
nice and flavorful sambhar...perfect with idlys. Looks so good with all those vegetables. oh wow...ur blog looks so diferrent and beautiful...i really missed ur wonderful recipes...this sambal looks yumm and very well expalined. Oh, this sound so yummy. Wow Divya!! my favorite sambar, perfect combo with crispy medu vadais!! So many vegetables! I love it! What a mouthwatering sambar!.superb..simply love it. 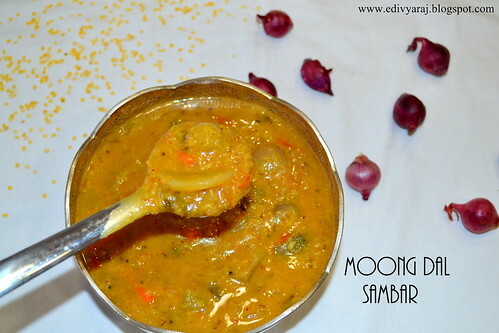 delicious sambhar,would love to eat with idli +ghee!! I love sambar in any form and never say no to it. Luv the twist of the dal in this. Looks delicious. 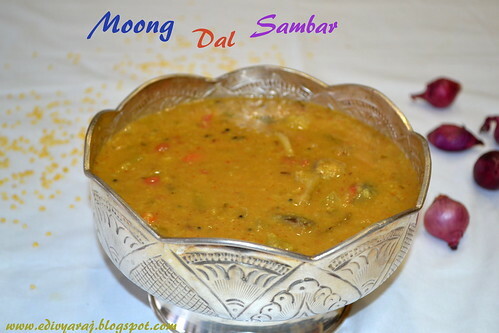 Wow...tempting sambar with moong dal. very neatly explained...yummy looking sambar. Delicious & healthy with all these veggies, looks yummy!